The guy broke into US top secret computers. They say he caused $800,000 damage - though he says he saved them money. He was looking for UFOs; imagine if he'd actually been a terrorist and it had been that easy. They needed better security. He did them a favour. They told the UK government to extradite him - & our government said OK. The guy has aspergers. Is he guilty? Is he culpable? Is he a terrorist? Should terrorism legislation be used for computer geeks persuing UFO fantasies? Or should extradition treaties be two-way streets? We do ask for US citizens to be sent over here to face our courts; 70% of the time we get what we ask for - though we have to show probability before getting them. The other way around, it's a 90% success rate, and the treaty only demands "suspicion" of guilt. 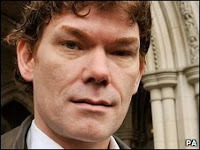 I don't know what's right in this case, I don't know what Gary McKinnon was doing & if his aspergers plays into the case or not: but I do know that the treaty all this is based on is one of the Blair government's most shameful moments. Justice must be based on equality, and this is not a just treaty. It should be repealed, and I hope Mr McKinnon gets appeal afer appeal and delay after delay until this treaty is repealed or torn up or altered so that it is a fair and equal partnership. I'm not questioning the fairness of the US justice system (...as long as you have the money and the influence, any system is fair) I'm stating outright that no one country should sign a treaty with another that puts their own citizens at a disadvantage, and that's what this treaty does. As far as I am concerned, Gary McKinnon can be tried & locked up for what he's done - but that should happen here, where he did his crime. Until our two governments have worked out that we all have equal rights. As the funeral of one of Britain's last WW1 veterans takes place today, the Poet Laureate, Carol Ann Duffy (whose name makes her sound like a character off the 1980s sitcom Bread, don't you think?) has written a poem to mark the occasion. I find it both slightly prosaic and deeply moving. It's a wonderful image of the might-have-beens of personal history. The old town clock bell warned the neighbourhood: it was a new chime but the same familiar message - eleven O'clock: Katie's Preach Easy was open for business again. It was six months since I'd been in Pontypridd, but the change Prohibition had made since Big Barry's Mob had rode into town with their big talk and bigger guns was plain for all to see. Old ladies scuttled to prayer meetings, clutching their shawls & rosaries. Large, burly, tattooed girls of seventeen stood silently on street corners hoping you'd ask for directions, fearing you might open the Chevy door a little wider and reveal one of the Archdeacon's men. He'd want to know where the hard stuff was all right, but you didn't want to have to tell him. Not and go home to your Mam. I knew Katie's from the old days. I knew the songs and the laughter, families taking the kids out on a Sunday for a touch of heaven to lighten up the load of living in Rhondda Cynon Taff. But this wasn't the old days. Big Barry lives in Cardiff. They aren't the same in Cardiff. They have chauffeurs and Starbucks and Marks and Spencer occupies three floors. It's a different world. Big Barry had these schemes - him in his purple shirts and his flunkies all in black - to drive fear through the hearts of all Glamorgan: and in his dotage, his schemes were coming thick and fast. Some says it's the English he's surrounding himself with. Others, he's just getting mean. Anyways, the last straw is - Big Barry turned off the taps at all the Preach Easys. He calls it "hygiene". Says it's "for everybody's good". No-one really understands it. But the Preach Easys - they can be pretty sneaky. Some are hiring hit mobs from the Legion of Mary; a dozen fearsome women with banners and signs, singing "Blessed Assurance" and condemning all weak-willed mortals who seek to break Big Barry's Prohibition Order. "Don't Whine About The Wine" they cry; "No Blood But Yours" they threaten. Sure, it's a front. The places that got these gals - they're giving out Communion by the gallon. But the Archdeacon - Big Barry's main hit man - he's fooled every time. And no-one's making him wise. They'd find themselves with a one-way to Penrhys, or Pete the Grave walking slowly infront of them, and them never walking again. It's that kind of community. Katie's just had two old women and a flag under the clock tower: "Lips that touch liquor shall not touch ours". It seemed a fair incitement to the Chalice for me. Stew the Warden nodded me in when he recognised me. "Cup's at the front", he said. "Quiet day?" I asked, seeing the pews outnumber the clients. "Oh, that's just the summer," he replied. "They're all in caravans in Porthcawl. That's where the real action is this weekend. Should be safe here." I nodded, grateful for the tip, and for the rain bucketing down outside. I'm a fair-weather caravanner myself. Not like most from these parts. It's bred into you. Just then a sudden movement amongst the musicians up at the front had me diving for cover - but Eirlys from Pets & Irrigation tapped me on the shoulder: "Dab, there's no need for that - Jenny just has a violin in that case. It's Morgan you need to watch out for." Embarrassed, I tied my shoelace before regaining my seat if not my dignity. That was lost amongst the chewing gum and sawdust on the kneeler at my feet. I tried to settle and listen in to Katie's regular Orator, Sleepy Joe Jones, but my trouble radar was buzzing on the back of my neck, and it wasn't just Eirlys' "Eau de Llanelli". Eventually Sleepy Joe was done and the Eucharistic was ready. It was time. The congregation was both excited and tense. 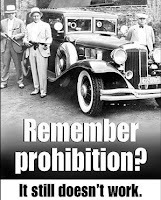 This was it - we were breaking Big Barry's Prohibition Order. There were kids skipping and old folk shufflin' and the rest of us trying not to reveal to each other just how desperate we were for a single sip of the Good stuff. It had been a month and a half since I'd last received; who knew when I'd do this again. When - Bang! The doors fly open and the two crones from the Legion run in screeching, "The Archdeacon, the Archdeacon!" Stew the Warden gets his wand, unscrews the end and removes the saftey. Sleepy Joe tells the children to hide behind the altar. Women are crying, fathers are standing tall, trying not to be too obvious as they hide behind the pillars, and the teenagers are awkwardly gangling in the same old corner not having noticed anything at all just yet. Morgan reaches for his violin case, but gets Jenny's by mistake. And as the Archdeacon's shadow falls over the threshold of Katie's Preach Easy, and the congregation inside suddenly feel what fear is really made of, Sleepy Joe Jones shows that a real man is more than talk as he makes to walk down the aisle and be the first in line to take whatever's coming his way. I'm not the brave sort. Never have been. Never will be. But a coward is a coward, a bully is a bully, and a fool is a fool, and I know decent folk deserve better than this. So I come out from behind the cabinet where the hymn books are kept, right in front of Sleepy Joe, & I push him back to his flock, so it's suddenly me walking straight up to the Archdeacon, who kind of looks surprised. "Who do you think you are, sunshine?" he asks, still in the porch, acolytes to the left and to the right. I can see the metal bar that locks the Preach Easy door standing by the side in its usual place. I can see that I have one shot. And I just leans on the back pew, like I own the place. But I'm ever so carefully picking up a Bible that's lying there, and flicking through it, finding the perfect reference. "I'm just a man looking for a crumb of redemption and a sip of grace. And no-one dies today." But what about the peace? I haven't been given any instructions so I don't know what to do - and obviously I can't trust my common sense, because the government hasn't given me any. For goodness sake. The government's own medical officer on yesterday's news called this "the mildest pandemic in history". And for this we break our worship? For this we scare people (it must be bad - we can't have communion)? Are we not Anglicans - are we not supposed to be measured and rather reserved? You of all people, from your tradition, are you not supposed to be able to apply reason here? Those who wish for both kinds - take it. Those who wish not to risk, or who are concerned, should restrict themselves with our blessing to the bread. Those who are cautious, should intinct, as many actually do anyway. Compromise, compromise - this is Anglicanism. Scare tactics are hardly resonant with our brand of faith, or have I missed something? Now: back to my question. If we are worried about vast swathes of people transferring disease through a common cup, what on earth is going to happen when they shake hands at the peace? Do you recommend we supply surgical gloves at the door as people enter, or simply a good supply of alcoholic wipes to be used after wishing the peace to each individual? And viruses are airborne; do you think it better we sing hymns using masks, or that we observe "praise silences" for the next eighteen months to two years - the period the pandemic is expected to last? The serious point is that the church's advice on pandemics refers more to Spanish Flu than Swine Flu; we seem to be confusing quantity for quality just because of the word "pandemic" - there are levels of severity of infection, and it may just be that the scare factor raised by the bishops' action at this point is greater than the public health good they hope to achieve. Less seriously, but entirely in keeping with the bishops' display of common sense, your good ideas on how to best increase the hype around Swine Flu, worry the frail and adversely affect our worship as a community are welcome. This summer, Geraint, TL & I will be updating the St Catherine's website. One of the features will be a different style of "news" page - I thought it might be easier to keep a blog which would be easy to access & maintain with news & reviews & photos and video snippets. It's hard to believe this is almost three years ago! The Confirmation service that ended the October 24 Hour Worship in 2006. This summer we are going to re-vamp our website, and in doing so want to re-work some video clips, and I thought this was one that stood the test of time. I hope you like it. My earliest memory that I can date with great certainty is of a holiday in Nefyn, North Wales, when I was two and a half. I can date it not because of the weather, or the beach, or any particular event in Wales - or even on earth. But because that week, Neil Armstrong and Buzz Aldrin walked on the moon. What I did not know then, or indeed at all until today was the following story - and I'm grateful to JD for the relating it to me. It seems that Buzz Aldrin took communion on the surface of the moon. Really! Here's the tale. Aldrin was an elder at his Presbyterian Church in Texas during this period in his life, and knowing that he would soon be doing something unprecedented in human history, he felt he should mark the occasion in terms of his faith. His pastor consecrated a communion wafer and a small vial of communion wine for him to carry up into orbit on the Apollo 11, and then down onto the lunar surface. Buzz Aldrin carefully took these elements, these remembering symbols, these tokens of life and death, of forgiveness and eternity with him as he travelled further than any man had travelled before. 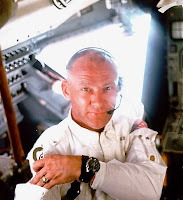 He and Armstrong had only been on the lunar surface for a few minutes when Aldrin made the following public statement: “This is the LM pilot. I’d like to take this opportunity to ask every person listening in, whoever and wherever they may be, to pause for a moment and contemplate the events of the past few hours and to give thanks in his or her own way.” He then ended radio communication and there, silently, 250,000 miles from home, quoting John 15.5 in the Sea of Tranquility, he took communion. Now I gaze up into the sky at a place beyond reach and know that man has touched it, and God has touched man upon it. How wonderful. The World of Who is buzzing with the news that Matt Smith has started filming as the next Doctor, and so we now know what he will look like in the role. Have you seen what they've done to the TARDIS? It's blue again! Even I can tell it's blue! (Unless it's purple - I spent 35 years thinking Dairy Milk was blue, only to discover it wasn't; I can't tell you what a shock to the system that cultural re-write was.) And it's suddenly regained the little crest it had years ago as well. Seems to me the TARDIS has regenerated with the Doctor. I rather like it. I wonder if they've changed the desktop theme inside aswell? But wait - who's that appearing through the mists of time? Now that ER is over, could it be that Dr Corday aka "the Doctor's wife" has had enough of all these flirty young things that travel around with her ever more youthful spouse? She doesn't look best pleased, does she? Now you can. For the first time in goodness knows how long (Ian, Stewart, battle it out amongst yourselves) the chimes are ringing at St Catherine's. Every quarter of the hour. They are beautiful. Not since I lived in Merton College have I lived somewhere with the comforting sound of bells punctuating the regular passing of time, now just four notes, next the eight, now twelve and then sixteen as the hour prepares to strike. Pontypridd is not Oxford, it's fair to say; but as, at last, I have finally lived somewhere longer than I did in that golden Cotswold city, and love to live here, I find in the turning of this time a constant ringing reminder of what was, as what is resounds though the ether and inexorably rolls on into what will be. Time. The strangest, most ephemeral of God's gifts. To mark its passing with a metronome is to catch moonbeams in tupperware. And yet the rhythmic sound of the eternally untouchable is ethereally lovely, and achingly glorious. I realise that yesterday, not ten miles away at Sophia Gardens, there were many England (And Silent Wales) cricket fans praying for rain in order to save the draw at the first Test against Australia (like the Australians are a sporting nation? Come on - we are better at the Olympics, rugby, football & tennis; how good at sport can the Ozzies be?) but here in Ponty we were praying for sunshine because it was our Summer Celebration Weekend, and as you can see from this lunchtime photo - the Lord blessed our prayers. We had a great day. And the team that organised everything worked really hard and did a fantastic job! Rhian and Julie & everyone - this would be an enormous post if I named everybody who contributed yesterday. The toddlers ballet class danced in church (quite spectacular) and we said our thank yous to Kirsty & prayed for her as she comes to the end of her time as Children's Worker. Kirsty is amazing; her work is wonderful; I am only glad that this was "thank you" and not "goodbye" - whoever comes to take on the role will still have her around to plunder as a font of knowledge and endless resource, though families will have to allow the new person to be the new Kirsty, as they had to allow Kirsty to be the new Naomi two years ago! Nicky Hopwood came and spent the day with us; she will be designing & making the new stained glass window that will be part of the joining of church & hall, and her workshop was really great value - though I was mistaken about it. I told people it would not design the window; I guess we didn't draw anything, but the ideas that came from the time we spent will certainly be used. So - those who didn't come missed a chance to be a prt of the creative process in a way I wasn't expecting! And Nicky said something, a throwaway comment, which I found surprisingly and deeply moving. She noted that one of our windows had been repaired at some point, and that clearer glass had been used for the repair than for the rest of the window. The sun had shone through it during my sermon, and at that point she had seen that it was "through broken-ness that the light shines most clearly". As I say, I found myself more stirred than I knew how to deal with at that moment by that comment. Anyway - a great day. And of course, having granted us sunshine, the Lord also granted us the miracle of Monty Panesar facing 35 balls and not getting out. Apparently Ricky Ponting whinged all night; those Ozzies really aren't terribly good at sport - or sportsmanship, are they? So the sun is shining and my balcony is employed! I have been walking today in the sun, and my camera has been enjoying itself spotting all sorts of things. Cows. Ski runs covered with flowers. Jutta van Eeghen invited me for lunch, and we had a lovely time as usual. So this is a photo posting - enjoy! I am too busy sitting doing nothing to be typing away here for long! Maggie Gerber & I walked up to Scheidegg and over to Mannlichen today. If there had been no cloud, we would have seen for miles. But there was cloud - everywhere! And a little rain - most of which we avoided, thanks to cunningly positioned cafes along the route. Good to spend time with Maggie, and to catch up, and to allow the Lord to work in my mind some plans for times ahead at St Catherine's as we spoke. The 24 Hour Events were born here. And now I think I understand more clearly how to work the homegroups in the months ahead. We shall see! Finally the cloud started to break this evening. Mountains became slightly visible at the end of the valley! (We did have sun first thing... but not since, really.) Still, it is a joy to be here. Internet access on holiday is a mixed blessing: it allows me to send "letters" to people I fail to keep up with in the normal rush of life, and of course, I do keep this blog, chat along on Facebook from time to time if I feel like it, and I freely ignore emails about weddings & banns & a host of other stuff (these will all still be there on Saturday) - but just occasionally people send me messages which I understand are personal to them (but requiring me to be the pastor), knowing I am away on holiday, and still slightly expecting me to deal with them today. Forgive me; I'll be home soon. It is 5% of my school's history since I left. The preacher at the 500th Anniversary Founders Day Service in Blackburn Cathedral began his sermon with a reference to Henry VIII, who became King in the year QEGS was founded & married Catherine of Aragon within weeks of his succession. "As Henry said to each of his wives, I shan't keep you long." As an historian (and I do think, given the pedantry of this comment, that articular 'n' is warranted) I sat there thinking, "He kept Catherine 24 years; that's one year less than I've been away from this school! I hope the bishop doesn't intend to preach either that long... or inaccurately..."
After the service (which included Jerusalem, Praise My Soul the King of Heaven and Cwm Rhondda, taking us around Britain but not across the Celtic Sea for an Irish hymn) I had the chance to chat to some former teachers: old headmaster Philip Johnston and his wife Cynthia, Barry Brown who was never a fan of my woodwork but always a good and encouraging man to me, Brian Hardcastle who tried to teach me Geography, and his ex-wife Myra who succeeded in teaching me French. Myra has MS. She was always glamorous, and the disease has been cruel. I did not recognise her. When I overheard PFJ and Cynthia mention her I was leaving the do, and I went back in to find her - and was glad to have done so. In 82 I took O Level French. I never spoke another word of it until I went to Marseille in 98 for the World Cup - and I discovered I was almost fluent. Good enough to get around without trouble. Even occasionally idiomatic. Myra & Arlette Lindley did that for me. It was lovely to be able to say thank you. Then it was onto Woodbridge for Seb's baptism - cousin Angie & Simon's boy, who is now my fifth godchild. It is always a complete joy to spend time with Angie & Simon, and with Abi too, Angie's younger sister, and to get to know Matt with her, and to see my Aunty Marie & Maurice, and Uncle Ken. It really is great to have time with them. I loved it. Lord, bless Seb. I am self-confessedly not a baby person; but help me to be faithful in praying for him; and please be more faithful in protecting them as a family and pour your love upon them daily so they may know the wonder of your presence. The shortest of sojourns at the wonderfully hospitable Harry and Tracy Latham's (again - too brief - and astoundingly Harry's mother has a springer spaniel who is the spitting image of Matty: really very, very like him; I have never seen a dog more like another) provided a resting place before the plane to Wengen. Ah! Wengen! Summer in the mountains. (Which means sunshine & showers, but peace & friends all around & a beautiful hotel and this view greeting me as I arrived from my balcony.) Bliss! Look no hands! Peering out over the environs of Pontypridd is a rather naked town clock. Following on from the Civic Service on Sunday, I had the pleasure of dining with Rob Smith, RCT's new mayor, for whom I am chaplain this year, and Russell Roberts, council leader. Russell was quite clear - the clock should be fully repaired. And so Barry & Roy, and today Barry & Dave came - first to make it work for Sunday (more of that in a moment) and then to make it work for good. This involves removing the hands - and gave me a chance to climb up inside the clock face and get some great photos out onto the town below. Years ago, Owen & Liz showed me a photo taken (I think) in the sixties of the Grove & Graigwen from inside the clockface. Now I have my own versions of these pictures. Normally you couldn't take such pictures - the clockface is opaque perspex. But to remove the hands, Barry had to remove the top segment of each face. And that gave me chance to look out onto the vicarage below & Graigwen to one side, and also out onto the Market Squre and the town centre. On Sunday, at the Civic Service, we started at exactly three, as the bell struck promptly. I was asked how long the service would last. "About an hour," I replied. "Depending on how long you go on for," the person answered back. I used that line in my sermon. Turns out my sermon was perfectly timed - for as we finished the national anthems at the end of the service, & I turned in the moment's silence to leave the church, the clock loudly struck four for all to hear. You'd think I meant it to happen. And soon it will do more than strike... for the first time in fifty years it will chime every quarter of the hour. I can only hope it stops from eleven at night till seven in the morning; or the natives may get restless... Here's Barry at work. Up a stairwell, then a long iron ladder, a short rickety wooden one, a bit of a leap (over a trap door) up to a climbing frame up a wall, then two or three more wooden ladders - and we are into the chamber behind the clock faces. No wonder Quasimodo had a hunched back.